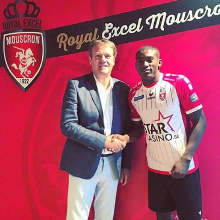 Liverpool loanee Taiwo Awoniyi was sent off for Royal Excel Mouscron in their 2-1 defeat to KSC Lokeren on Saturday evening. The 20-year old was shown a straight red for violent conduct in the 74th minute of the game, the first in his professional career. Awoniyi tried to get the ball from Arno Monsecour and planted an elbow in the face of the Lokeren star who suffered a nose bleed, the defender was yellow carded a minute later after he had recovered. The former Golden Eaglets and Flying Eagles sensation had a record of never picking up a red card in 64 appearances as a professional before he took the walk of shame at Stade Le Canonnier (Mouscron). During that time, the attacker has been cautioned seven times. Awoniyi, who has tallied seven goals in the league, could face a three-game ban for the straight red card, and that could be increased or reduced if the Royal Belgian Football Association review the incident.